If you spend a lot of time seated, and you leave work at the end of the day saying “Oh, my aching back,” then this is the chair for you. The Backsaver from ERA Products comes by the name honestly, with floating spring suspension that guarantees your comfort all day long. 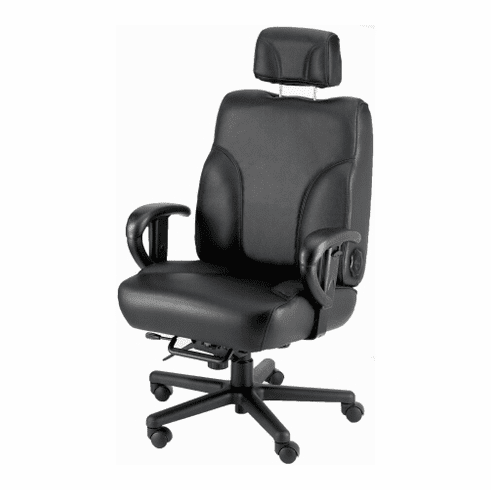 It also features four-way adjustable lumbar support, an adjustable padded headrest, and contoured, thickly padded seat cushions. It’s also fully adjustable, so it can accommodate any height or body type – even up to 500 pounds. The frame is all-steel, and you can choose from commercial-grade vinyl, stain-resistant fabric, leather with mock leather trim, or even a full leather model. Why spend another uncomfortable moment? ERA offers a limited lifetime warranty on this model.